Redwell interviewed a Verisae subject-matter expert and wrote the copy for this 16-page case study. The client did the editing, design, and production work. Who would read a 16-page case study? Exactly the right kind of prospect. At a first meeting with a multi-billion-dollar grocery chain, a Verisae sales rep met the company's energy director. The prospect had this document in front of him, its text heavily highlighted in yellow. The document helped open the door to a sale worth millions of dollars to Verisae. 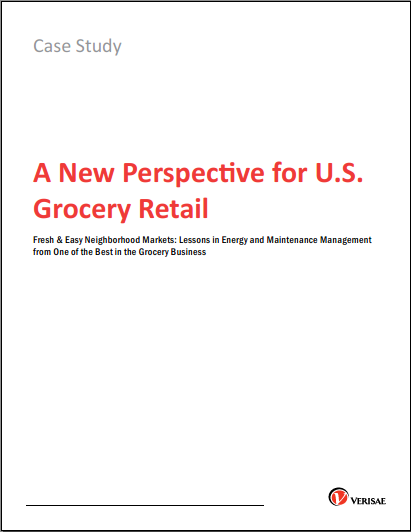 Read how Fresh & Easy Neighborhood Markets achieved some of the best energy-management performance in the North American grocery business, using Verisae's solutions. The story opens with a hero (Verisae's customer) who faces a big challenge. It describes the magnitude of the challenge the customer faced. It describes in detail how Verisae's customer achieved his goals and overcame his challenges with Verisae's help. It shows how Verisae achieved big sales results with low-budget marketing.